From the Configuration menu, click Inventory Control. This page allows store admins to configure how the software handles inventory tracking and display of products that are out of stock. See this page for more information. Limit cart to quantity on hand - If this option is checked, customers will only be able to add the maximum amount on hand to the cart. If they try to purchase too many of a product, they will see a warning message and the cart quantity will be adjusted to the quantity on hand. Show inventory table - If this option is checked, an inventory table will display on product detail pages for products that have multiple size/color attributes and are using the "Track Inventory by Size and Color" option. NOTE: Store admins will see an actual inventory count, customers will only see Yes/No for in stock. 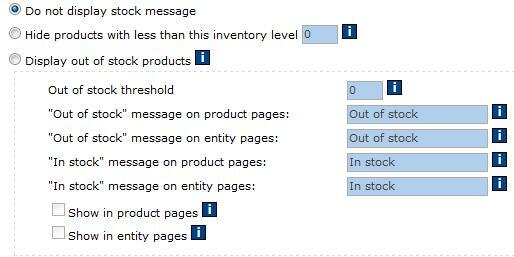 Do not display stock message - If this is selected, inventory quantities are ignored and all products are displayed. Hide products with less than this inventory level - If this option is selected, products with an inventory less than the quantity specified will be hidden from all customers. Out of stock threshold This number determines when the 'out of stock' messages will begin showing. "Out of stock" message on product pages: This message will display on product detail pages for products with less stock on hand than is specified in the threshold above. "Out of stock" message on entity pages: This message will display on entity pages for products with less stock on hand than is specified in the threshold above. "In stock" message on product pages: This message will display on product detail pages for products with more stock on hand than is specified in the threshold above. "In stock" message on entity pages: This message will display on entity pages for products with more stock on hand than is specified in the threshold above. 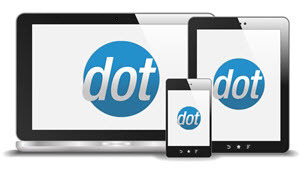 Show in product pages Checking this will cause the messages specified above to display on product detail pages. Show in entity pages Checking this will cause the messages specified above to display on entity pages.